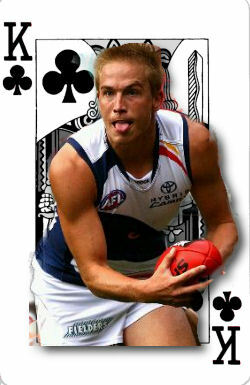 Bernie Vince is a very good looking man. Probably not a good reason to pick him in your Dream Team, but if you want an under-priced player with a whole lot of potential, then the blonde bombshell from Adelaide could be a very good unit to consider! Why should I pick him? He is another player who supports the 3rd year rule. In 2008 (his 3rd year) he improved his average by a huge 37pts from the previous year. A year later this gun was averaging 100 (2009). But last year, with heavier tags and a few injuries, Vince dropped his average to 85.3 (counting an 11 he had in his last) making him worth looking at in 2011. So… can he produce the same numbers of 2009? I reckon he can come close. He finished that year smoking with an average of 136 in his last 3. Under priced premiums are golden! Why shouldn’t I pick him? He has a bye in Rd. 2, I personally don’t like that, not that early. I guess if it happens that early though it can be easily managed with ‘playing rookies’. In the past he has struggled to handle a tag. He only cracked 100+ a tiny 31% of the time last year and basically had a year to forget. Deck of DT Rating. KING – if you are picking this dude then he’s a keeper for you for the entire year. Worth looking at for sure after an under preforming 2010 based on what we know he can do. Another plus for this lad is that he can pump out big games cause over the last 2 years we’ve seen numbers like 145, 136, 134, 131… and we all like those! Would love to fit him in to my team, in an akward price range and i believe there are beter mid options out there. Going with the guns and rookies in the middle. I think we’ll see him improve from last year but there are better options for that dough figure. I like early bye, bound to have rookies playing early rounds so all good there. Great choice for the Deck. He’ll have a good year but I don’t think he’ll get that 2009 form. He’ll be nicely priced and he’s a smart buy, gonna think about this one. A tricky one for me! Me trading in this guy caused me to miss the top100,but Vin makes some good points.Perhaps leave cash to upgrade rook/mid price player after round 3 before round 4 where that bye comes in handy.Not only will he have only 1 more bye for the year,you get to see him for two matches first yet get him before a price rise if he guns it! Pardon the pun, but definately on the cards! Ultimately will boil down to strategy as I’m tinkering with the idea of starting premiums in the midfield that done have their bye till much later. N.b will be interesting to see when the teams name their interchange, & when they have to declare which one will be the sub!? I reckon he and Adelaide will have a much better start to the season than they did in 2010…………Could end up being quite popular and valuable………A great pick for the decxk and certainly in my thinking for DT11. Like Bilby he is also going for my underpriced premium position. At the moment Liam Anthony is just ahead of him but its a long pre season so lets see what happens! I’m looking at making my midfield up of Swan and Hayes with one of Anthony or Vince and then Swallow and two other rookies, maybe Gaff? Anyway we will see what happens! i would probs pick liam anthony over bernie ey, bernie will get the number 1 tag with all the crows superstars leaving, and at the roos, swallow or harvey would get the tag before liam anthony, so yehh, i reckon go anthony..
are you talking north melbourne swallow or gold coast swallow ?, my midfield will be swan, selwood, anthony, cotchin, gaff, 2 decent rookies, like swallow kieran harper /. shaun atley ;) ?? Yeah thats what I was thinking to about the whole Anthony and Vince thing. Vince will average between 90-95 I think so yeah at this point Anthony is the way to go! So you are picking Selwood? It was a toss up with him and Hayes for me. I went Hayes just because you know what you are going to get with with and now that Ablett is gone Selwood could get the number 1 tag. Still its not even Christmas yet, so there is along way to go. Selwood might smash out some big scores in the NAB cup and convince me to go him over Lenny. yerr no doubt, i think the 3rd year rule really does go in anthonys favour, aswell as him missing a fair bit of last year, which means his price will be down, im on him ;)., yerr i think selwood will be a deece pick, he can shake the tag, and there is bartel etc in there which will draw other attention, lenny hayes (soon to be cousin,, due to marriage ;) ) will have a fair good year im thinking, like you said, you know what your gonna get, and that is pretty much 100+ every week, although, he is getting older, do you think its a problem ?. yerh bloody oath, im soo keen for dt to open, feb 1st ?? take it easy, have a good chrissy and new years, dont get too rare !! I’ve been using m0nty’s fanplanner and my midfield so far is Swan, Hayes, Mitchell, Cotchin, S.Hill, and H.Bennel, with bench Mitch Wallis, Josh Thomas, and some $70,000 player. Lol might wanna check that buddy. Given the young midfield brigade of Adelaide – Vince will continue to struggle with a heavy tag. Of course Neil Craig is known for his innovative ideas so we will see how things pan out in the preseason comp. I’ll pass on Vince at this stage. Yeah, with Ablett gone he’ll get alot more midfield time. Also, under a new coach, maybe we can see him playing a new role? In midfield or forward, he’ll be a smart buy. What about Chris Knights? Had a great 2009, but last year was injury-ridden. m0nty’s fanplanner has him at a nice $228,300, so could be a smart pick up. Great for the Deck. Not 100% sure where N Foley is at but if he is ready to go for round 1, he will be my value pick midfielder. And hence the reason I will be once bitten, twice “get that guy away from me”: Vince suffers knee blow: http://www.afl.com.au/tabid/208/default.aspx?newsid=106366. I’m going to stay clear from vinny for now, upgrade target possibly.